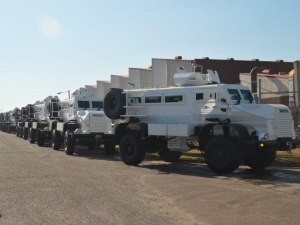 The Council for Scientific and Industrial Research (CSIR) has developed a low-cost add-on protection package to protect armoured vehicles against explosive attacks, especially by explosively formed projectiles, also known as shaped charges. The CSIR said its add-on armour is efficient and more realistic in weight and cost than similar solutions, although it is more bulky. The Council pointed out that most armoured vehicles cannot withstand the impact of shaped projectiles or explosively formed projectiles (EFPs), which create a cone of melted metal (typically copper) that punches straight through armour. Lightweight add-on armour is available, typically using special ceramics and different high-tech polymers, but these are costly – often prohibitively so to many customers. The CSIR’s product, on the other hand, makes use of spaced polymer panels reinforced with a combination of materials that are much more affordable. Despite appearing large, it is extremely mass efficient, the CSIR said. “The technology is not only effective against EFP threats, but also counters most ballistic threats up to calibres of 20 mm and grenade launchers. The technology can be tailored in terms of mass and dimensions and can be used by all armoured vehicle manufacturers. It is either retrofitted in an add-on configuration onto vehicles or built into passive armour systems. The technology can also be combined with other protection technologies,” the CSIR said. Apart from armoured vehicles, the technology could also be implemented on other land systems solutions and in the maritime domain as well. The technology is fairly mature, having undergone testing in what the CSIR calls a representative operating environment. It has been fitted onto a Casspir armoured vehicle. According to the CSIR, “the main competitive edge of this technology is the cost. The materials used in this solution are commercially available and the manufacturing does not require sophisticated infrastructure. The exact materials and manner of positioning are key to the invention to be discussed under non-disclosure agreement with prospective partners.